Italian Prime Minister Silvio Berlusconi addresses reporters, Dec. 17, 2002 (Photo: Gabriel Bouys/AFP). In November 2002, Italy reeled in shock when its former prime minister, Giulio Andreotti, was sentenced to 24 years in prison for complicity in a 1979 Mafia-related killing. Now, the testimony of another mobster is in the spotlight, and is proving politically embarrassing to Italian Prime Minister Silvio Berlusconi, his right-hand senator Marcello Dell’Utri, and his political party, Forza Italia. On Jan. 7, 2003, Antonino Giuffre—once a key aide to the fugitive Mafia kingpin Bernardo Provenzano, now an informer—confirmed that Mafia figures had been in contact with members of Berlusconi's Fininvest company to negotiate the terms of their political support for Berlusconi’s election campaign. He also clearly stated that several Mafiosi, including a Palermo boss named Stefano Bontade, had met the Italian premier at his villa outside Milan many years before Berlusconi entered politics in 1993. According to Giuffre’s testimony, Bontade used to go to Berlusconi’s villa to visit his friend (and Mafioso) Vittorio Mangano, who was employed as the stable manager at Berlusconi’s country estate, Villa D’Arcore. Giuffre is testifying in the ongoing trial of Senator Marcello Dell’Utri, who stands accused of laundering mob money through Publitalia, the publishing company he formerly managed. 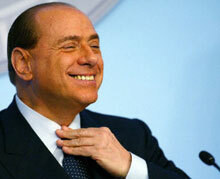 Publitalia, which is Italy’s largest publishing house, is owned by Berlusconi’s company Fininvest. Prosecutors allege that the Sicilian-born Dell’Utri was very close to top mobsters and allowed the Mafia to use Fininvest accounts to launder dirty money. In the last national elections in 2001, Forza Italia won all 61 Sicilian seats in Parliament. Dell’Utri's lawyer dismissed the allegations as an “anthology of hearsay” and argued that the revelations came after the 180-day time limit of the special law for “penitent” Mafiosi such as Giuffre. Leonardo Guarnotta, head judge at the second criminal division of the Palermo Court of Law, responded by saying that the statement was a clarification of a testimony made months earlier, and that facts were more important than dates. Giuffre’s revelations continue to make headlines in the Italian press. As a result of his latest testimony, on Dec. 22 the anti-Mafia pool of prosecutors of Palermo decided to proceed with a formal investigation of Forza Italia MP Antonio Mormino, who is also vice president of the Parliamentary Justice Commission and a former lawyer for Giuffre. Over the course of his legal career, Mormino has also defended the Madonia family, reputed to be a powerful Sicilian Mafia family, Mafia boss Bagarella, and godfather Salvatore Riina. According to Giuffre, Mormino was elected in Sicily in 2001 with the support of the Mafia, which was looking for new, “clean” connections in the Italian Parliament. Milan’s centrist Corriere della Sera reported that in July 2002, jailed godfathers sent a coded message to several lawyers-turned-politicians who had once defended Mafiosi. In the message, they complained that agreements with the Cosa Nostra had not been honored. Mormino was offered protection by the Secret Service, which he refused, claiming he had no agreements with the bosses in question. But on Jan. 18, 2003, an article in La Repubblica revealed that Mormino had added a clause in a parliamentary bill pardoning Italian prisoners that would have extended the pardons to include prisoners convicted of Mafia-related offenses. The clause was challenged by the Italian center-left coalition and Mormino and his party made an official apology for the “small mistake.” The public interest in Giuffre’s allegations, and Mormino’s “small mistake,” prompted the current public inquiry. Whether or not Giuffre is telling the truth, his allegations have increased Italians’ distrust of politicians, and Berlusconi’s Forza Italia party in particular, and have undermined the public’s faith in the judicial system. “How is it possible that the current Italian premier is accused of having strong links with the Mafia and nobody has expressed indignation?” asked Rome’s left-centrist Il Riformista on Jan. 8. The answer could be that Berlusconi controls 90 percent of Italian TV stations available to Italians free of charge and owns several newspapers. But it could also be that Italians are no longer shocked to hear that their politicians—including the prime minister—may have Mafia ties. As Giuffre’s allegations continue to appear in the Italian press, former Prime Minister Andreotti is appealing the guilty verdict he received for complicity in the 1979 murder of journalist Mino Pecorelli, who had been planning to publish damaging information about Andreotti. The former prime minister has strenuously denied any involvement in the killing, but Italians may already be seeing a pattern.